I was doing walk for around for kids at a Chicago library yesterday. They remodled, grand opening. I was doing standard stuff--sponge balls, silk to egg, other stuff. Some of the kids had fun. Others were more into video games. And they all went to a dance thing in another room. So i spent a lot of time standing around. I did B'wave for two girls in 6th grade and the reaction was perfect. But i feel like i was not very effective, all in all. Should i wear a flashy outfit ? Should i learn to make ballons ? I am not used to walk around with kids. I usually just do a show and that's that. I need to learn ! Approach them as an uncle (or aunt). Be accessible, open, flexible, and fun. Be a kid yourself. Talk to them, not at them. Treat them like little people, not little boys and girls. Engage them. Respect them. Give them what they want, but only after they earn it. Kids love scary stories, and I always tell scary stories, but only after they achieve agreed upon milestones. Relax. Don't be afraid to be goofy or silly if it's in your nature, but don't fake it cause they will know. Entertain them. Make 'em laugh. Or scream. Let them be kids, but only within the boundaries you set. I usually wear Hawaiian shirts, but I love Hawaiian shirts and wear them well. They suit me. What sort of dress suits you or the occasion? You have to be comfortable in order to be your best. Do they want balloons? If so then perhaps they should hire a clown. Or a balloon twister. Or, if it's something that will greatly enhance your income, then learn to make a couple of balloon animals. But only if it suits your style. It sounds to me as if you did what you were paid to do. If it was your first time with kids, it sounds like you did okay. Maybe a bit apprehensive? Yeah, they knew it. Plus it sounds as if there were a variety of activities from which to choose, and some of them were way cooler than the magician! Hard to compete with dancing and video games. Whoever hired you should have considered that during the planning process. Like anything else, working with kids takes time and patience. If it's something you want to pursue I might suggest volunteering some time where you can get more comfortable. Again, it sounds like you met expectations. Sometimes that's enough. I don't get hired for kid events specifically, but often for festivals where there are a lot of kids. Card tricks, where kids sign and get to keep the cards work well for me. The signing of the card gets the kid invested in the trick. Getting to keep the card makes everyone else want to do it also, so that they get a souvenir card. Then I also have other magic to perform as well. But you can build and keep a crowd with one signed card. If you want to add insurance, have a few people, from a few different groups of kids sign the card. I've done that and torn the card into their signed pieces and given those away as well. Just to add to EVILDAN's of idea signed cards you should look up Chad Long's trick "Scatch"
Basically he adds a lottery ticket scratcher type sticker to the back of the card. Once the card is returned to the Spectator they get to scratch the card and reveal the suit of the card. He does a Chicago Opener type routine after which the spectator can keep the card. I bought a roll of 100 stickers for $6.00. 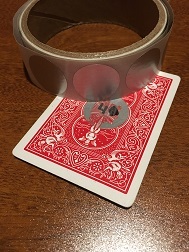 If you don't mind gaffs and giving away cards I can see lot's of potential tricks and uses these stickers and hide all kinds of messages on cards that will create a fun and unique experience. Equally I also think AV's advice on interacting with kids is also worthwhile. I made a good living from kidshows for many years. (Retired a couple of years ago). Birthday parties, children’s events, family shows, plus countless educational programs for schools, daycares and libraries. But to prepare for all that, I had to really invest time and effort into researching and understanding the psychology of performing for kids. That’s an art in itself! In addition, I worked hard at continuity, audience control, and making sure there were no lapses in my presentations. I also devised subtle, built-in techniques to maintain focus. Anthony posted some good advice above. Treat the kids with respect but above all, make them laugh and enjoy themselves. The younger kids react better to “funny business’ than they do to magical effects. Whereas the older kids appreciate being blown away. That said, I’m glad my performing days are over. I don’t think I’d have the patience to deal with the incredible lack of concentration prevalent in young people today. I'm definitely not very experienced with kids shows. I do them occasionally but generally anticipate a negative experience for me. But when I do the show, I always end up having fun and thinking that the experience was very positive. Nonetheless, the next time I get a call for a kids show, I try to pass it on to someone else. So, ultimately I'm not very experienced in this area. But I have a few thoughts that could be helpful. I think you have to be fairly energetic to get attention and keep it. Most really good kid show performers that I have have seen e.g. Silly Billy, do mostly shtick. I think these guys have videos of them performing that might be good to look at. After a certain age, maybe 11 or 12, the kids are not as susceptible to energy and shtick. They'll watch, but often their goal is to bust you. That's another whole can of worms. I'd do bulletproof stuff for that group to avoid getting busted. Things that are visible from a distance can be good e.g. a rope trick or vanishing hanky. That can get kids who are keeping some distance until they size up the value of the show, to watch, get interested and come closer. You can call them in too as in "Hey you guys, come over here. This is for you..."
Maybe there's an idea or two of value here. Good advice all over. Mike, i dont think i came across as energetic. In fact, one kid asked me why i talk slow. Anthony, there was a balloon guy there before me !